If you’re near the Seacoast this weekend, come join the Seven Stages Shakespeare Company at Portsmouth Book & Bar in Portsmouth, NH at 6:30pm on Monday, February 19 for the first public workshop of our new adaptation The Shrew, adapted by Montgomery Sutton from William Shakespeare’s “The Taming of the Shrew” and the anonymous “The Taming of a Shrew.” Get your booze and your Shakespeare fix at the same time! Professional actors, script in one hand, beer in the other, present a reading of a different Shakespeare play each month. ShakesBEERience is FREE FOR ALL, Or Pay What You Will. 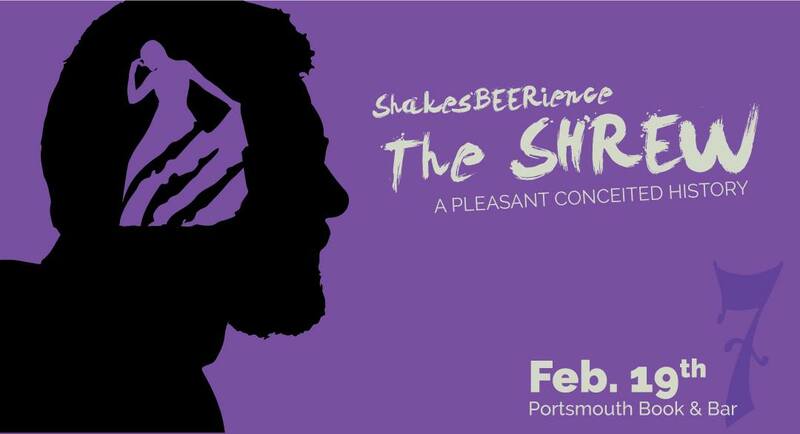 Since it’s creation in 2012, Seven Stages Shakespeare Company‘s ShakesBEERience play reading program has played to standing-room-only crowds one Monday night a month at The Press Room in Portsmouth, NH. The program has since expanded to happen quarterly in partnership with Buck Hill Productions in San Jose, CA, and in June 2017 launched in Brooklyn, NY! This sixth season of ShakesBEERience in New Hampshire will take place at Portsmouth Book & Bar at 40 Pleasant Street in downtown Portsmouth, NH!